Adhese Video, Mobile, Banner, Email advertising network details. 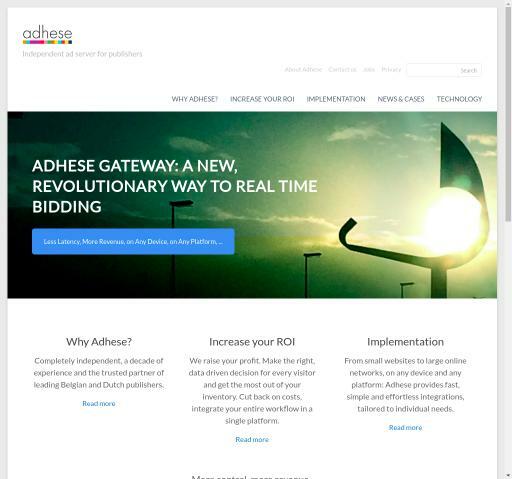 Adhese - a full scale ad monitoring and ad serving tool, streamlines the process of publishing information, integrating advertisements, whether it is with your websites, videos, email campaigns, smartphone or tablet applications. For publishers, we provide you with a customized and personal approach to your yielding strategy, turning your websites into cash-generating machines. Also, with Adhese, brands deliver your message to the most relevant audience you want, anywhere, anytime. Our team of experts with profound knowledge enable marketing agencies to focus on creativity while getting real results, helping you create effective strategic solutions for all your customers. You can check Adhese reviews on Affbank and ask Adhese Team any question by using the contacts above, especially about how to earn money!